First look: Audi A7 cabriolet | What Car? 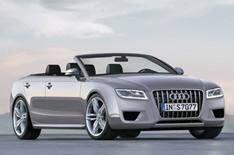 These images show how the Audi A7 cabriolet could look when it arrives in showrooms in late 2009. The car, which will go on sale a few months after the saloon model, is expected to feature a conventional soft-top roof in order to preserve the cars boot and rear passenger space. Engine choices are expected to be similar to those of the A6, and include a 255bhp 3.2-litre V6 and a 350bhp 4.2-litre V8. A Lamborghini-derived 435bhp V10 unit is also expected to be included in the range, linked to quattro four-wheel-drive.